This dark, thick, meaty brown soup, often served with sherry or Madeira, was much loved by the Victorians. Or was it? Take a look at any recent English food history tome and you'll be told that Brown Windsor soup was the Victorians' favourite starter. And that it was served everywhere from royal palaces to boarding houses. In fact, it's been described as 'the very soup reputed to have built the British Empire'. You'll learn too that it was thick and stodgy and that everybody hated it. All of which is very odd as there are no references to it anywhere in anything published during Victorian and Edwardian times. In fact this 'Victorian and Edwardian staple' doesn't turn up until the 1950s. 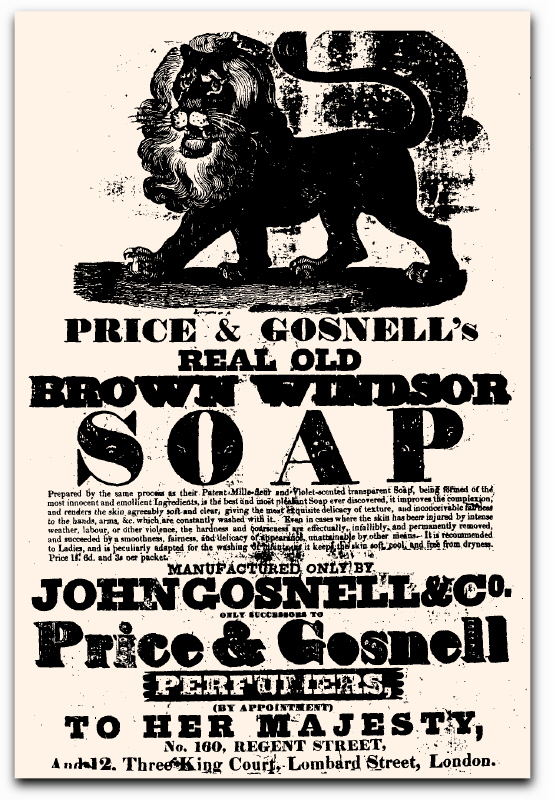 Brown Windsor Soap, however, is referred to frequently from the 1830s. Could it possibly be that the name was applied to ubiquitous hotel brown gravy soups as a joke, perhaps parodying the well-known rice-based White Windsor soup? It definitely has some history as a joke soup, even appearing on the menu at Fawlty Towers. Meanwhile, the 1994 TV version of 'Hercule Poirot's Christmas' has the Belgian detective lamenting to a hotel waiter that his soup "does not look very delicieux", to be told "Well, sir, it IS Brown Windsor", though the scene isn't in Agatha Christie's original 1930s book. The Independent on Food's recipe describes it as "occasionally heard of, but never seen". The British Food Trust seem to think it is "one of those soups that for years has had a terrible reputation". Marguerite Patten in her 'Century of British Cooking' is pretty sure it was "a very indifferent dish", but admits she can find no record of it. Of course I remember Brown Windsor! Some people, including Norman Tebbit, Clarissa Dickson Wright, Peter Hitchens and a huge number of Daily Mail readers seem to remember it being served, though they can never quite remember where. Or when. In fact, if Google Books is to be trusted, there are no references to it in books and magazines before 1961. But while it may not be in old cookbooks, it is prominent in such recent culinary classics as 'The Unofficial Harry Potter Cookbook' and the (equally unofficial) 'Downton Abbey Cookbook' as well as John Pearson's' 'Authorised Biography of James Bond' and Helen Rappaport's 2003 biography of Queen Victoria. So it seems that Brown Windsor soup has become emblematic of the bad ol' days of horrid English cooking, damp hotels and the sort of "mustn't grumble" attitude which we're glad to have put behind us. 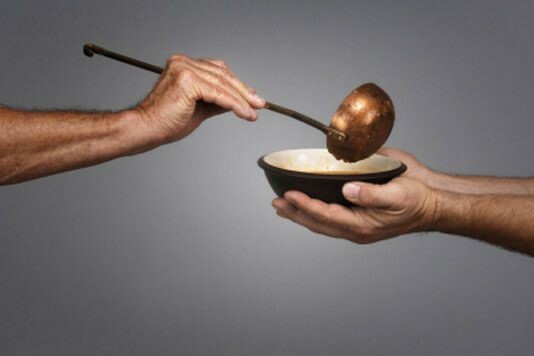 All of which is very odd, as it isn't easy to understand how a simple soup could be in any way horrid, or even if it was, why people supposedly kept on serving it. In fact it looks as if Brown Windsor soup did indeed begin life as a joke, and a fairly recent one too. With thanks to the sleuthing of John Leiska and Rory O'Donnell, the absolute first references we can find to it are where Alec Guinness, in his best Alec Guinness sneery-voice, says "I can thoroughly recommend the Brown Windsor Soup" in the 1953 Ealing film comedy 'The Captain's Paradise'. Meanwhile, Tony Hancock ponders throwing "a plate of Brown Windsor down the back of his neck" in a restaurant sketch in an episode of his BBC radio comedy Hancock's Half Hour broadcast on 15th February 1955. SEAGOON: Very well then. If the Scots want to make it a war on nutrition, we have an English dish in our armoury twice as deficient in calories as porridge and twice as deadly. SEAGOON: Yes, Brown Windsor soup. And they didn't stop there. The Goons carried on and on with Brown Windsor soup jokes for years, always as a synonym for silly Englishness. They had: "I successfully changed all the Chinese back into Englishmen by giving them injections of Brown Windsor Soup" and "Hoist a small Union Jack and unveil a bust of Queen Victoria. Now I'll just make a rough 'Englishman lost on the mountainside Menu'. Brown Windsor soup, meat, two veg, cabinet pudding." We can therefore officially conclude, pending any new evidence (and dismissing with a regal wave any information to the contrary) that Brown Windsor soup was invented around 1950 for comedic, not culinary, purposes, and all other histories of it are complete fantasy. Do you remember eating Brown Windsor Soup? If so, let us know in the comments below.